It's more musical with the 6db filter slope and the different filter option, and it has more features from the Bx dynamic EQ. The only drawback for me is the DSP consumption, it's twice more hungry than the Bx digital Eq v2 ! The Brainworx bx_digital V2 EQ plug-in was always the first plug-in in my mastering chain and I thought that there is no better. But now with the new bx_digital V3 plug-in it has been made even a better Plug-In and for that I thank Dirk Ulrich of Brainworks. By the way: the Mix version is also great. The V2 I have used on every Vinylmastering (benn a few so to speak...) since it was released for UAD, now the V3 has taken it´s place, best have been even better. A must have for a mastering tech. Versatile, clean eq. v3 has got some useful features. what I appreciate most especially in comparison with all eqs from Universal Audio: the low end goes much deeper and you can give a signal weight without colouring it or make it sound "thick" or muddy. Bx digital V2 was one of the best MS processors on the market. But now, V3 is a trip to paradise (of sound). Notch filters, dynamic EQ across the entire frequency range and still great sound . Thank you for this upgrade and great compliment! I love this Eq, excellent for mastering with the MS function and also very good in the mix version for vocal or instrument shaping. The dynamic Eq function is very useful too. Try the demo you won´t be disappointed! The MIX using MS with Brainworx bx_digital V3 EQ is TOP. Harnessing MID-SIDE manipulations in your mix using Brainworx bx_digital V3 EQ puts everything on the next level. This is my new go-to EQ, and that's a big thing because it replaces the V2 which I thought was irreplaceable. The Dynamic EQ is da bomb. Bravo Brainworx! it's a must in the mastering chain, really cant recommend it enough! really transparrent and flexible, and the de-esser that is build in is a super thought! I know bx v2 as got it from bx as well. The v3 have improve in functionality. One of the best MS eq on the market. Not much to say but try the demo. This is now my go to ms eq . Had this as a native plug but got a great deal from UA . this is a must for mastering. I was already in love with the Brainwory Bx Digital V2 when i first got into UAD products, i was able to use it on everything, specially when it Comes to Mastering or Stem Mastering. This Plugin does not have a certain Sound, but it does everything u want it to do....i guess thats what u can call Musical. 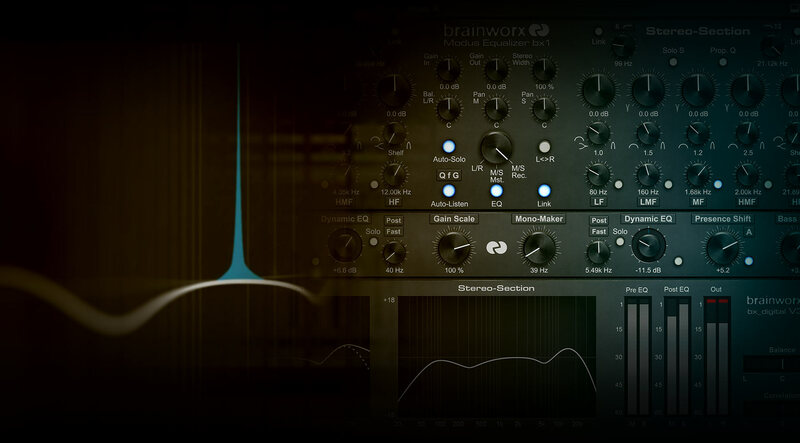 Good Job again Brainworx and thnx again for making Mastering a Piece of Cake! BX V3 is quiet a step up from V2. I've tested last night the "air" band on a mix I was working on, I use the V3 along with the UAD Bax into the ShadowHills (hardware) and I had is that smile on my face. Just checked next morning ...even better with fresh ears YES!! Mention to the deesser/dynamic eq functions as well as the different tone on the low and high tilts. I've had V2 for sometime and it was a good tool for specific issues. However V3 seems so much better! Dare I say it...V3 it doesn't sound as sterile as V2 seemed to be. The high end seems improved but maybe it's just my imagination. The new features are very usable. Great eq - wish I would of waited to buy it. Throwing money away aside, the plug in itself sounds and functions great. The UI was very well though out, along with it's features. I use it on every mix that I touch. I was excited to get the Brianworks EQ. I used it to enhance the sound of the paino and it worked soomthly. Getting the sound I wanted was made easier by the new bass and presence shifters.